Powers/Abilities: Able to fly. Superhuman strength, can breath in space, can shoot energy beams from his hands, super senses, cosmis awareness. 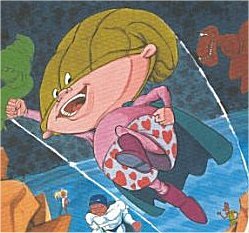 History: Super Shlumper was a failed attempt by a being named Brainstorma to create a galactic defender and was subsequently thrown away by her. He was found near The Dead Sea by Israeli soliders in the year 1968. The army wanted to use him as a weapon but Yossi Shwartz, an Israeli solider, pitied the baby and gave him to HaKoakh HaMaggen, who adopted him. After fighting against another of Brainstormas failed experiments (who was evil and violent) SS gained a cosmic awareness and became the galactic defender he was meant to be. His archenemy is Darklun. There used to be 5 Darkluns, but they were merged to one (that isnt as strong as the five together). Comments: Created by Uri Fink. Thanks to Lior Bergman for providing detailed origin information for him, and also informing me of his enemies and affiliations.